A decade ago in September 2000, world leaders had come together at the United Nations Headquarters in New York to adopt the United Nations Millennium Declaration, committing their nations to a new global partnership to reduce extreme poverty and setting out a series of time-bound targets – with a deadline of 2015 – that are now known as the Millennium Development Goals (MDGs). The eight MDGs – which range from halving extreme poverty to halting the spread of HIV/AIDS and providing universal primary education, all by the target date of 2015 – form a blueprint agreed to by all the world’s countries and all the world’s leading development institutions. They have galvanized unprecedented efforts to meet the needs of the world’s poorest. To ensure effective implementation of the Declaration, the UN Millennium Campaign was established by the UN Secretary General in 2002. 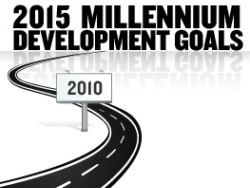 The Campaign supports citizens’ efforts to hold their governments to account for the achievement of these MDGs. With only five years left until the 2015 deadline to achieve the Millennium Development Goals, UN Secretary-General Ban Ki-moon has called on world leaders to attend a summit in New York on 20-22 September 2010 to accelerate progress towards the MDGs. From September 17-19, the UN Millenium Campaign calls people across the globe to turn up the volume on their call for heads of state gathering at the UN on September 20-22 to demonstrate leadership in order to achieve the MDGs. Concerts are being organised across Bangladesh, Cambodia, Columbia, Ghana, India, Indonesia, Korea, Nepal, Papua New Guinea, the Philippines, Rwanda, Senegal, and Zimbabwe, where local artists will sing their support of the MDGs. In Jordan, 40,000 children are expected to simultaneously blow whistles in support of the MDGs, in an attempt to set a new world record. In a similar campaign last year, more than 173 million people had participated in “Stand Up,” setting a new Guinness World Record. On 18th September (Saturday), 6 pm onwards the majestic Purana Qila in Delhi will resound with rhythm as 100 musicians perform for the MDGs. A photo exhibition entitled, “We Can End Poverty” will showcase progress on the MDGs. :: Delhi Greens :: » October 15th 2010: Global Blog Action Day on Water!